Moraira is a Spanish Mediterranean beach resort located between Calpe and Javea, on the Costa Blanca. 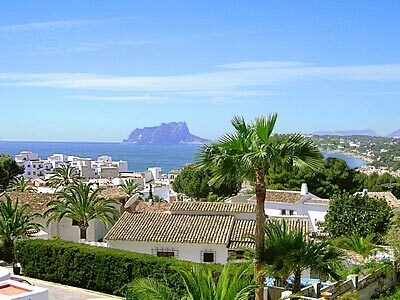 Most of the Moraira villas and houses are south-facing, and many come with sea view. This resort offers beautiful and sometimes high standard properties, with quite exclusive equipments. Benitachell (Benitatxel), located between Jávea and Moraira Teulada, offers many recently built villas, and some modernised or to be modernized “fincas” (country houses), the latter generally on large plots of land, sometimes with sea view, and always in quiet places. Every kind of property can be found in the “Cumbre del Sol” estate, almost all houses, apartments and villas with an incredible panoramic sea view. However, the slope of the area does not make a Cumbre del Sol property advisable for a disabled person suffering mobility disease. With INSERT, a network of selected property agent in Moraira, Costa Blanca, you buy and sell your property safely and in confidence. Do you often visit this page ? With your browser's refresh button, you are sure to get the last version. Last updated: November 29th, 2018. For further details, simply click on the photo of any property that interests you. With INSERT, you buy or you sell safely. I promise.